I always try to find something healthy and different and SUPER easy. As a working mom of 3 kids I don’t have time to slave away in the kitchen! But I love making fun, healthy goodies for my kiddos and this is an amazing idea – and they can do most of the work themselves – and they’ll love it!! Let them get creative with sprinkles and even fruit – maybe try chocolate fruit kabobs? Have some fun and enjoy your Memorial Day goodies! Cut the banana in half lengthwise, then in half to make four quarters. 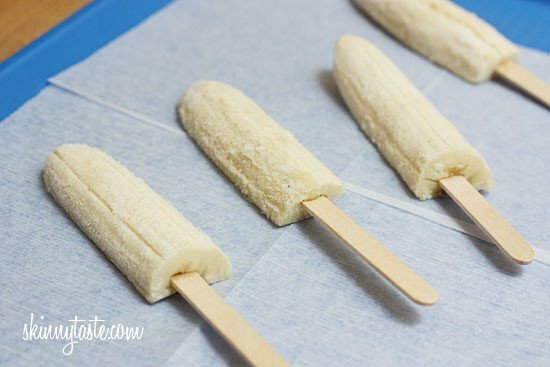 Insert popsicle sticks into bananas and freeze on a wax paper lined cookie sheet. Cute hand model not included! Dip the bananas one at a time into the chocolate, scraping off the excess chocolate from the back of the banana, and place it on a cookie sheet lined with wax paper. 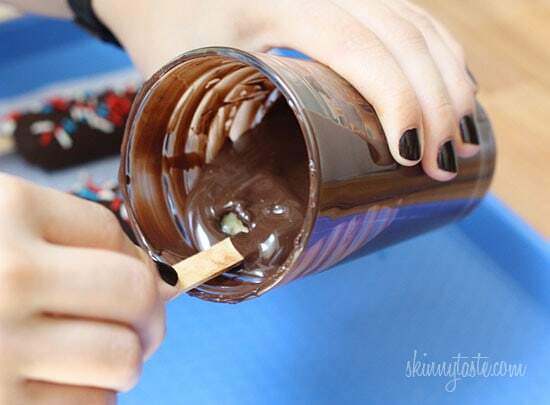 Quickly add the sprinkles or toppings on the rounded side before the chocolate hardens (you have to work quickly here). Place on wax paper and return to the freezer until frozen and ready to eat. Eat frozen and enjoy!! *Based on 0.5 oz of chocolate per banana. If you use a large banana, you will use more chocolate and will need to adjust.